Clark Named a "Washingtonian of the Year"
In a ceremony in Washington, D.C., today, Washingtonian Magazine named Clark School alumnus and benefactor A. James Clark (B.S. '50, civil engineering) one of its Washingtonians of the Year. The honor recognizes those in the area who "give their time and talents to make this a better place for all of us," according to the magazine's web site. "Mr. Clark's impact is broad and profound," said Clark School Dean Darryll Pines. "Because of his vision and generosity, there is a premier academic engineering program in Washington where vital scholarships fund the education of hundreds of young men and women. Everyone at this school acknowledges a debt of gratitude to A. James Clark." Today's ceremony was attended by UM President C. Dan Mote, Jr.
Clark has given major gifts to name the school of engineering and to establish a scholarship endowment for students in need. 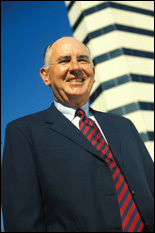 He is the chairman and CEO of Clark Enterprises, Inc., which includes The Clark Construction Group. The company is responsible for building structures such as the MCI Center, FedEx Field and Oriole Park at Camden Yards. More information on this honor is available in the January 2010 issue of Washingtonian Magazine. "Because of his vision and generosity, there is a premier academic engineering program in Washington where vital scholarships fund the education of hundreds of young men and women."